A brass band is playing on stage, a fairly large Ferris wheel is in place to offer extra fun, and information is being distributed in various tents. On the “Kö”, Düsseldorf’s famous Königsallee, and at Schadowplatz there were a few booths offering food and drink. It rained often. But it was not the poor weather or the fairly pathetic attempts to foster festivities that prompted people on February 20 to head underground instead. 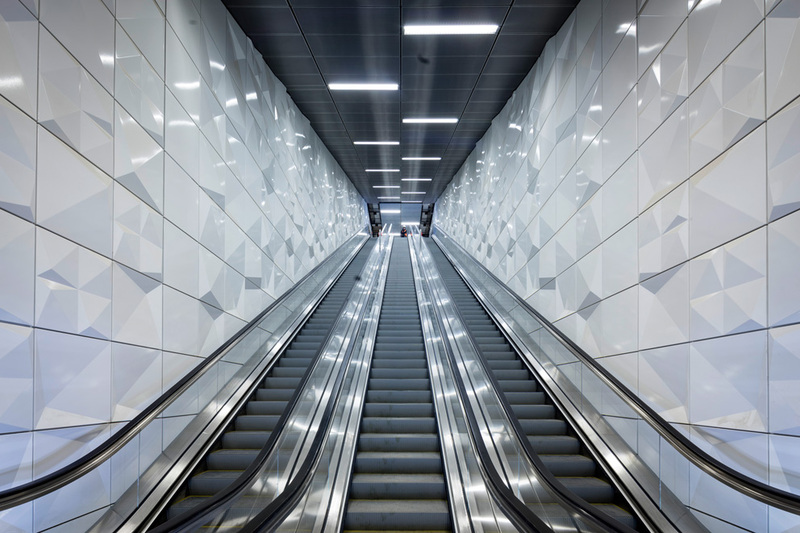 Because that Saturday something quite astonishing and exciting was open for public perusal for the first time – under the ground: Over eight years after the initial groundbreaking ceremony, the Wehrhahn subway line has now opened. 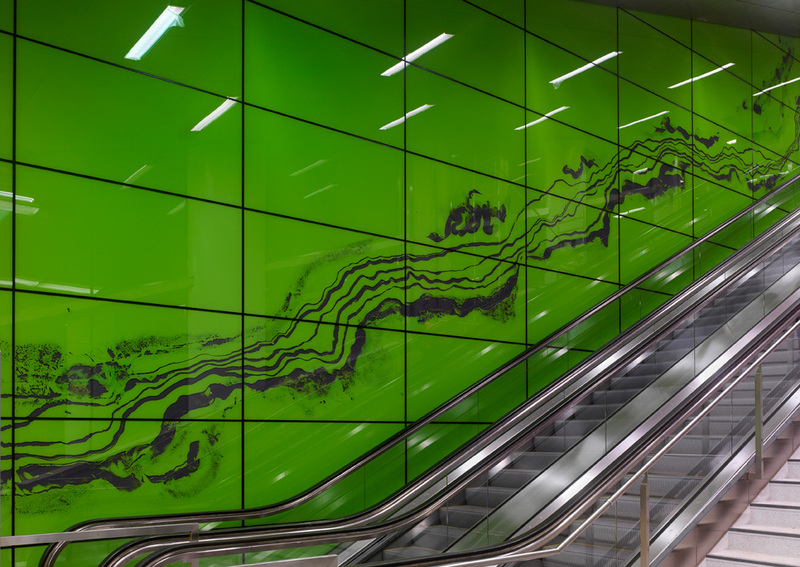 Back in 2001 Darmstadt-based Netzwerkarchitekten joined forces with artist Heike Klussmann and won the pan-European competition for the design of the six underground stations that are linked by a 3.4-kilometer-long tunnel. The opening was truly a reason for celebration, and not only because in Düsseldorf, capital city of the State of North Rhine Westphalia and tormented by countless building sites and much conversion work, at long last a public transport bottleneck had been eliminated and downtown was better incorporated into the transport network. Thanks to the architecture and the art, at the opening the embarrassing rhetoric of boastful local politicians à la “We can handle large-scale projects superbly” became secondary. The six stops on the Wehrhahn Line, along which four streetcar lines run, are impressive testimony to the fact that quality is not a question of the construction brief. Architecture as spatial art, art as spatial imagination – the confidence shown in a young architecture office has really paid off. 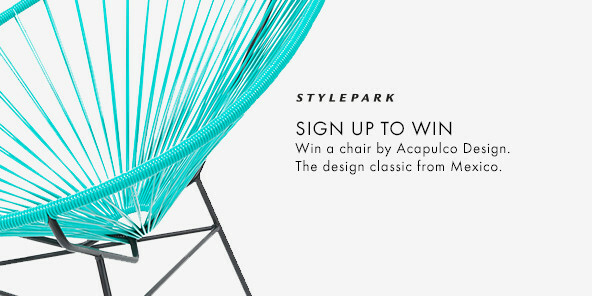 Netzwerkarchitekten collaborated not just with Heike Klussmann, but with five other artists selected in a competition back in 2002 and involved from the very beginning in the design work. 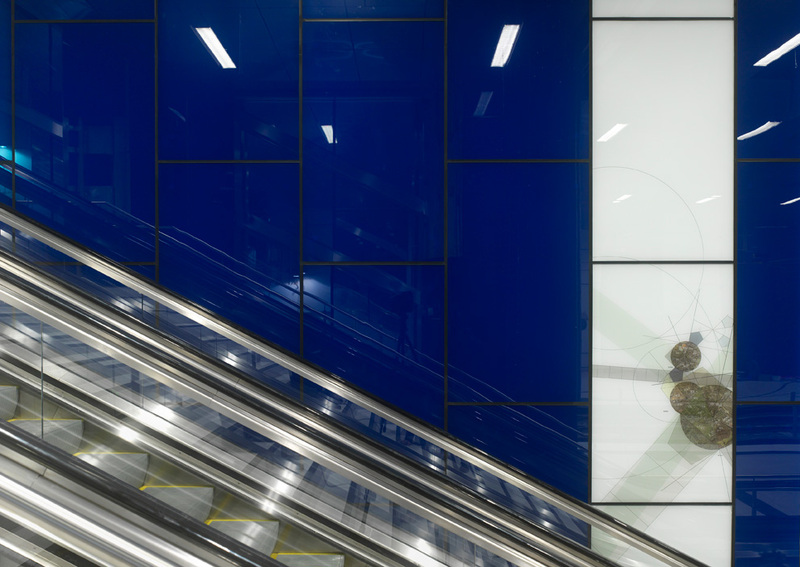 From the outset, the overarching idea was to derive a three-dimensional figure from the respective specifics of the location, a figure that conveyed a sense of space and forged visual links between overground, the distribution level and the tracks. An important guideline was the notion of the air above us: In the one instance there is a view of the sky from the tracks, in another of large airy spaces, and in a third of shafts that broaden downwards and bring daylight into the station. All these devices serve to combat any feeling of confinement; the track is never isolated from the rest of the subway station. 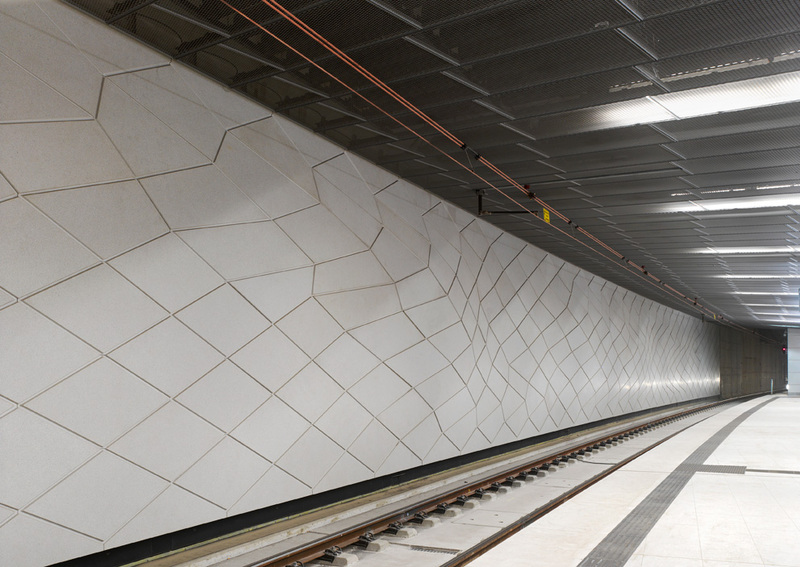 Heike Klussmann developed a pattern of diamonds that can be varied such as to create an impression of bays and bulges and which is used on the trackside walls in all the stations. 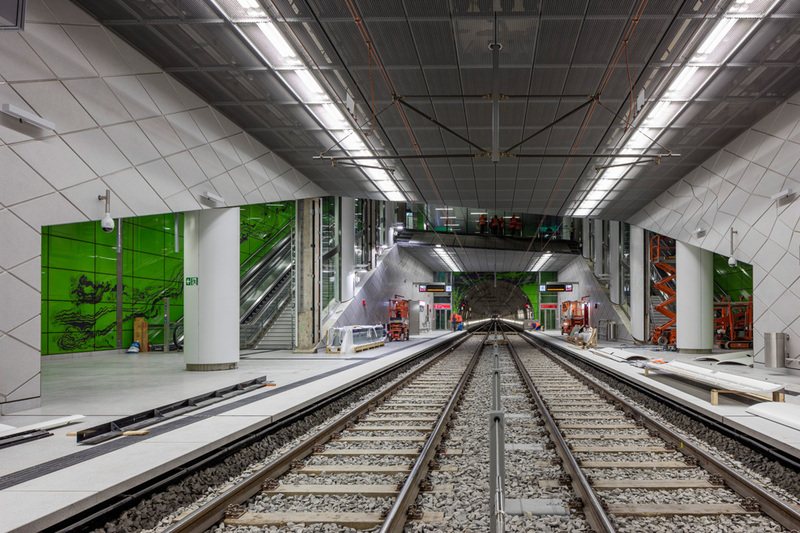 It forges an imaginary link between the stations and thus down the tunnels and is based on the idea that the entire complex can be construed as a continuum, which is also the title taken for Klussmann’s work. The implementation is also remarkable. An elaborate manufacturing process was required to mold the concrete, brightened with pigments, into shapes that were then cut with computer-aided precision such that for all the acute angles they then fitted together to the millimeter – the seams between them were even structured such that sections of the wall can be opened should this be required for maintenance work. Concrete art in the dual sense of the word: The shapes refer not just to something external to them, but are also inseparably bound up with the material from which they are made and with the process whereby they were made. 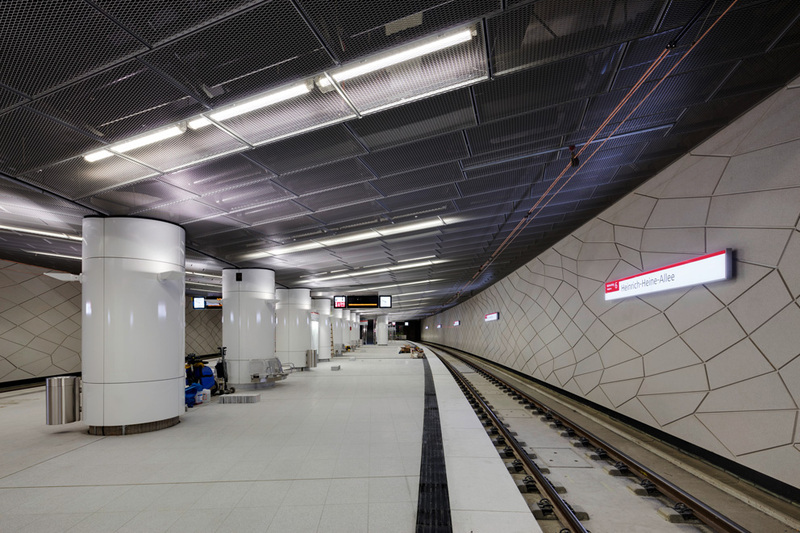 Heike Klussmann also designed the “Pempelforter Strasse” station. Strips that intersect to form a set of crosses linking the floor, walls and ceilings are extended to direct the flow of movement from the entrances, breaking up the architecture’s geometry to form a series of branches in a way that an imaginary structure superimposed on the real space seems to continue it beyond its actual limits. 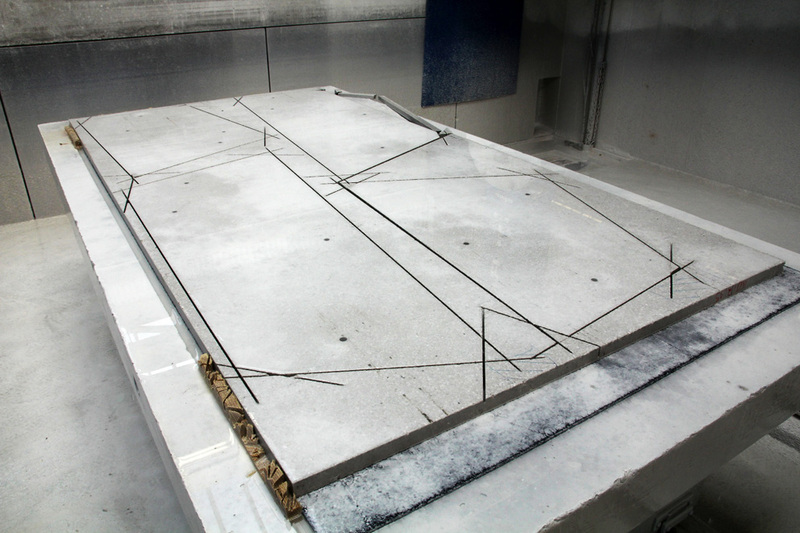 In his piece entitled “Achat” Manuel Franke also forges an imaginary space behind the actual limits. 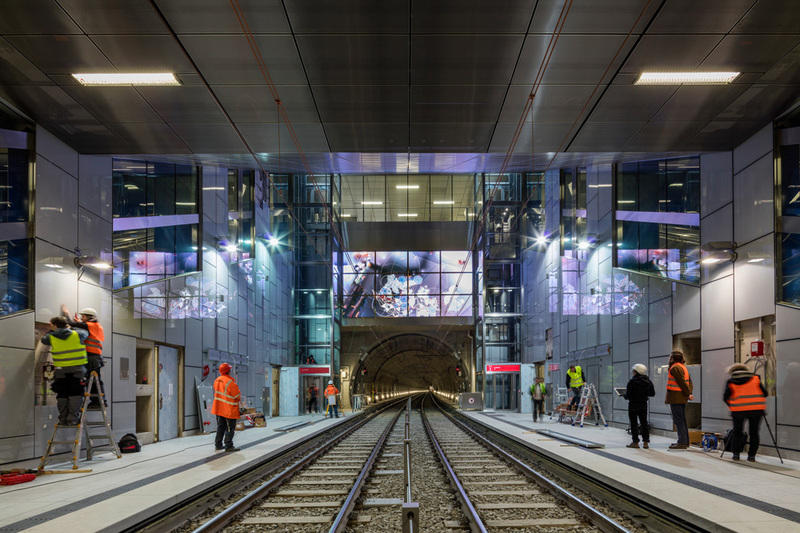 The glass panels of the “Graf Adolf Platz” station are made of two layers. The lower layer is dyed dark purple, the upper layer gleams in a lush green. 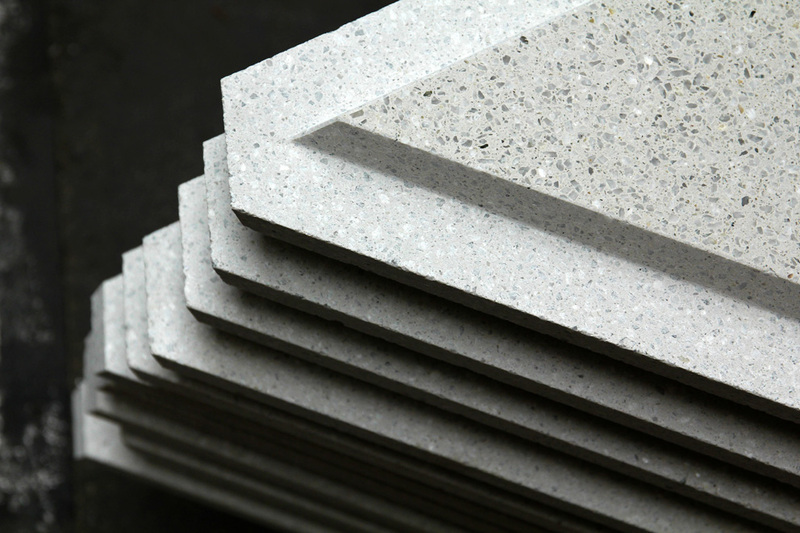 Franke treated the upper layer of color during production, partially removing it, and thus creating the impression that the railway station has been cut here into an existing gem, the grains of which can be discerned at the cut edges. Thomas Stricker has audaciously gone furthest into the realm of imaginary spatial worlds. 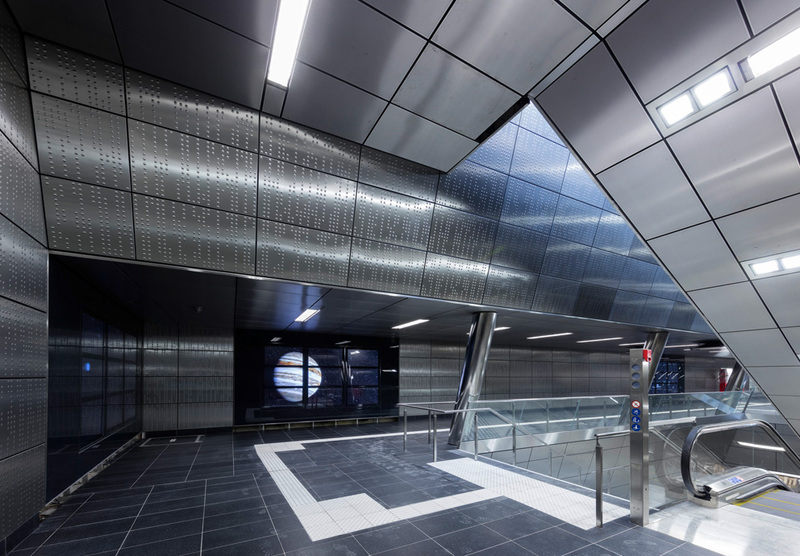 In consultation with the architects, he has transformed the “Benrather Strasse” station into a spaceship with burled metal panels and titling walls. It is an approach that would hardly have been possible if, following the customary method of “art for buildings”, the artist had first been involved in things once the architectural design was complete and ready to go. Stricker turns the distribution level into the navigation bridge, animations based on ESA and NASA data on six large screens simulate the station’s flight through outer space. The calm imaginary trip is by no means monotonous thanks to the changes in direction and kindles many an association – not just here, one might easily miss a streetcar without being troubled by the fact. 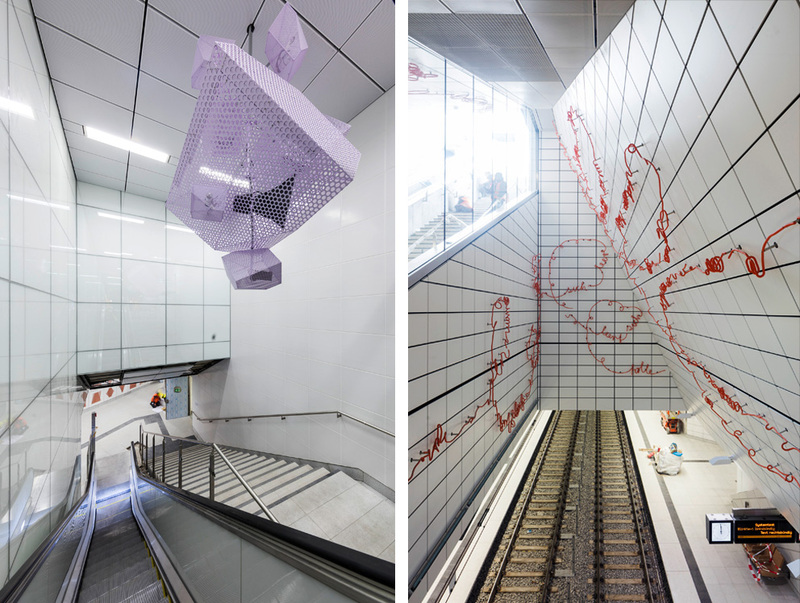 In the “Heinrich Heine Allee” station designed by Ralf Bög, there are, for example, three sound installations to be explored – they run on integrated sound systems and are intended for use by different artists and composers. And at the “Schadowstrasse” stop there’s a large screen showing an interactive installation by Ursula Damm. 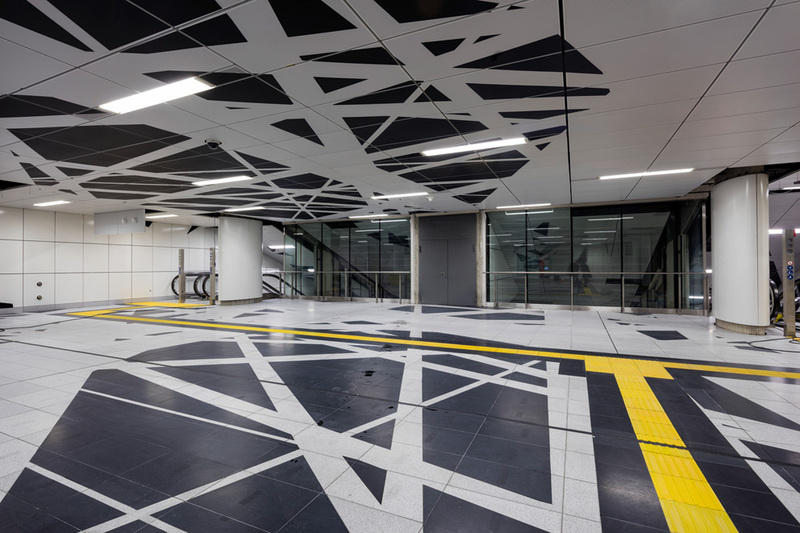 Algorithms then translate the movements of passers-by at the entrance to the station into geometrical patterns that resemble a kaleidoscope, such that recorded reality morphs into a complex pattern. 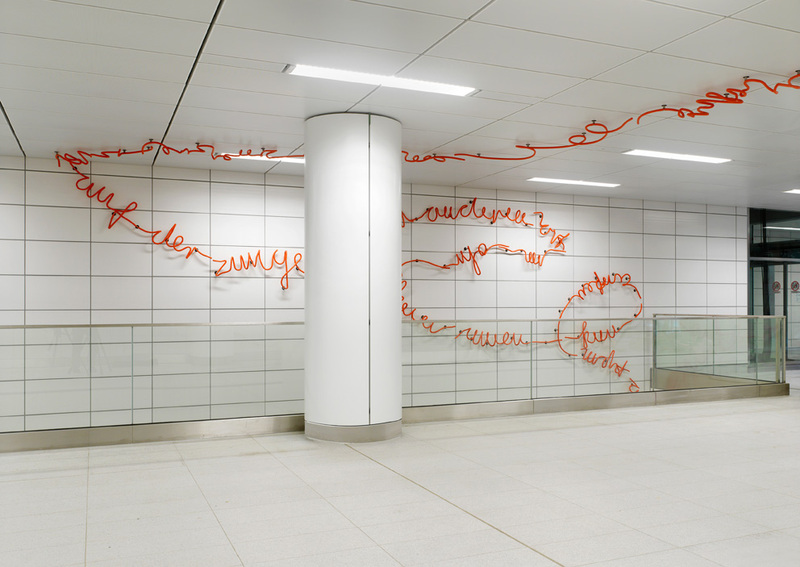 Finally, Enne Haehnle chose four strips of writing made of twirling bright red, milled metal for the “Kirchplatz” station, which is clad in white ceramic panels. The individual words are only legible from a very specific perspective in each instance, although they never add up to a clear statement, leaving much scope for interpretation and firing the imagination. Part of the success story of the Wehrhahn Line is that the city authorities kept firmly on the track they had chosen as regards its design, and it was built just about on time and in budget, and in the process no advertising spaces were allowed. A project on this scale cannot be realized if the specialist planners, the architects and the municipal authorities do not cooperate smoothly. 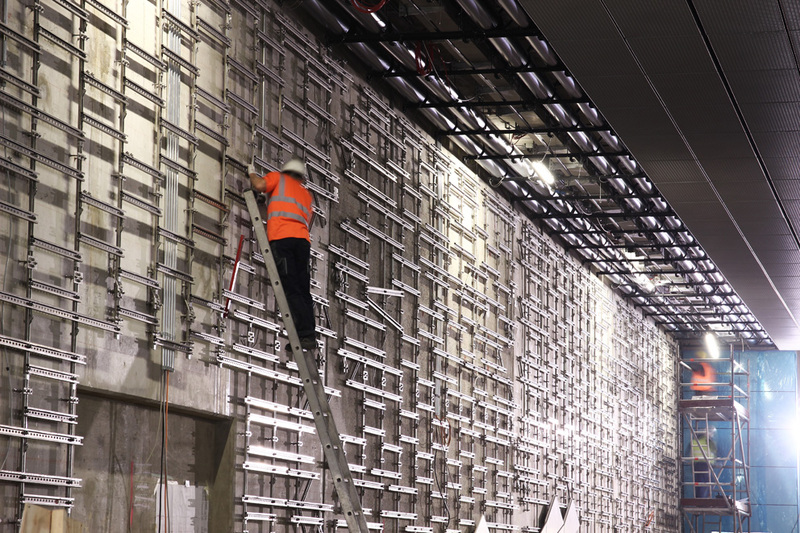 In the station areas, mainly a cut-and-cover method was used, meaning that once the shaft had been cut, it was then covered before the construction work proper started. This way, local inhabitants and passers-by did not face excessive disruption or noise. 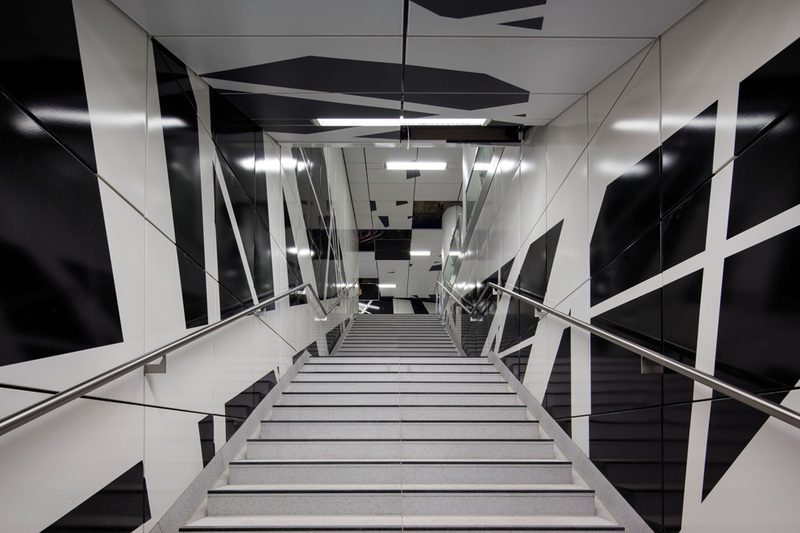 Only at Heinrich Heine Allee was a different construction method needed, as there the new stop had to be located vertically next to the existing subway line and is located beneath a heritage-listed department store. The project hinged here on a so-called freezing method, whereby protected by a temporary thick layer of frost the underground volume was excavated as if in a mine shaft. Where the lines run overground, the sculptural concrete mouths to the tunnels are glazed white and attest to the design standards that have been so convincingly adopted the whole way along the track. The emphasis now must be on caring for the stations and adhering to the no-ads policy to preserve the new treasure that runs underground. And also to take it as a strong resolution on how to tackle the other projects that are still in the pipeline. In the recent past, Düsseldorf has not always covered itself in glory: The demolition of the Tausendfüssler flyover in favor of a tunnel came at great cost, with ramps that cut right into the urban space. Today, a shopping mall straddles the area of the erstwhile overground traffic intersection that has now been rendered superfluous by the Wehrhahn Line. The underground standards are by contrast gratifyingly high and they could surely serve well as the new yardstick above the ground, too.